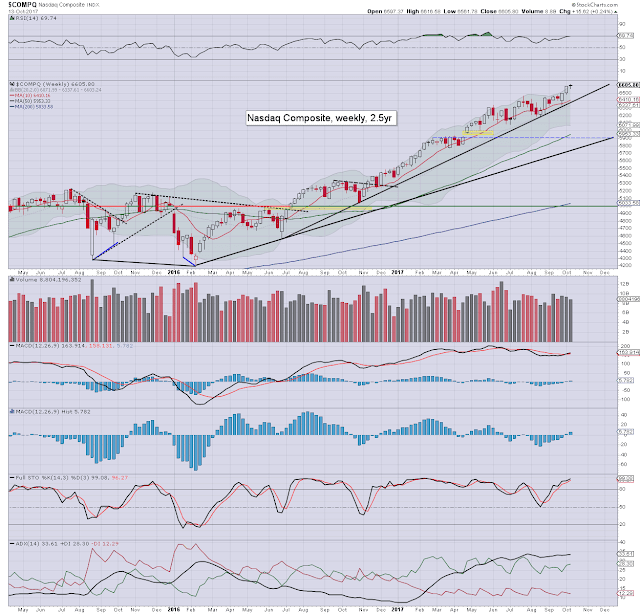 It was another bullish week for US equity indexes, with net weekly changes ranging from +0.5% (Transports), +0.15% (sp'500), to -0.5% (R2K). Near term outlook offers a cooling wave of 3-4%, but broadly, the US market remains super strong. The year end target of sp'2683 is just about within range. 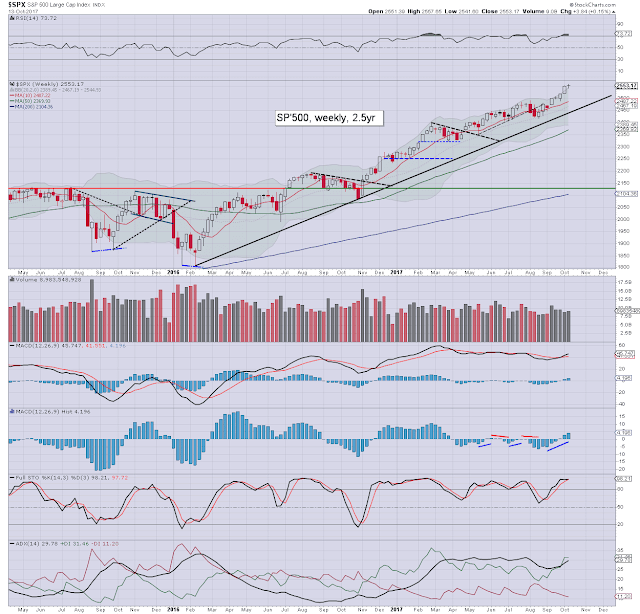 The sp' climbed for a fifth consecutive week, +3.8pts to 2553, with a notable new historic high of 2557. Underlying MACD (blue bar histogram) cycle ticked higher for a fifth week. The key 10MA is currently at 2487, and will be around the 2500 threshold next week. Core rising trend from early 2016 will be around 2450 next week, notably just under primary target of 2474/61. Best guess: near term cooling of 3-4% to the Sept'11th gap zone of 2474/61. No sustained price action <2460, with another whipsaw upward to the 2600s. The year end target of 2683 is just about within range, but will require a Dec' rate hike, along with WTIC around $54/55s. Since the Feb'2016 low of 1810, to this Friday's close of 2553, the sp'500 has gained 41% across 21 months. At the current rate, the sp' will be trading around 3500 in summer 2019, with 4000 by spring 2020. 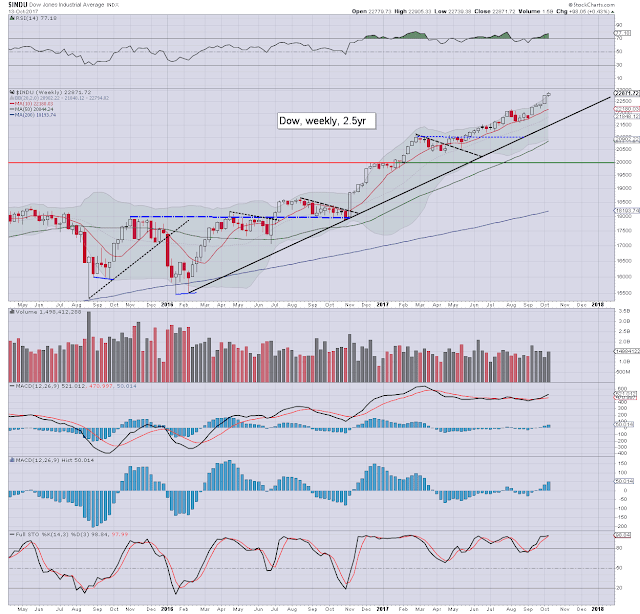 Equity bears have nothing to tout unless a break of rising trend, and a bearish monthly close. For me, that would equate to a monthly settlement under the monthly 10MA, which is currently at 2423 (and rising by around 35pts a month). I do not anticipate such a bearish close before year end. The Nasdaq climbed for a third week, with a net gain of 0.2% to 6605, and a new historic high of 6616. The core trend from early 2016 remains comfortably intact. At the current rate the 7k threshold will be within range by year end. First soft support are the 6400s, with secondary of the 6100/6000 zone. No price action <5900 looks remotely possible within the mid term. 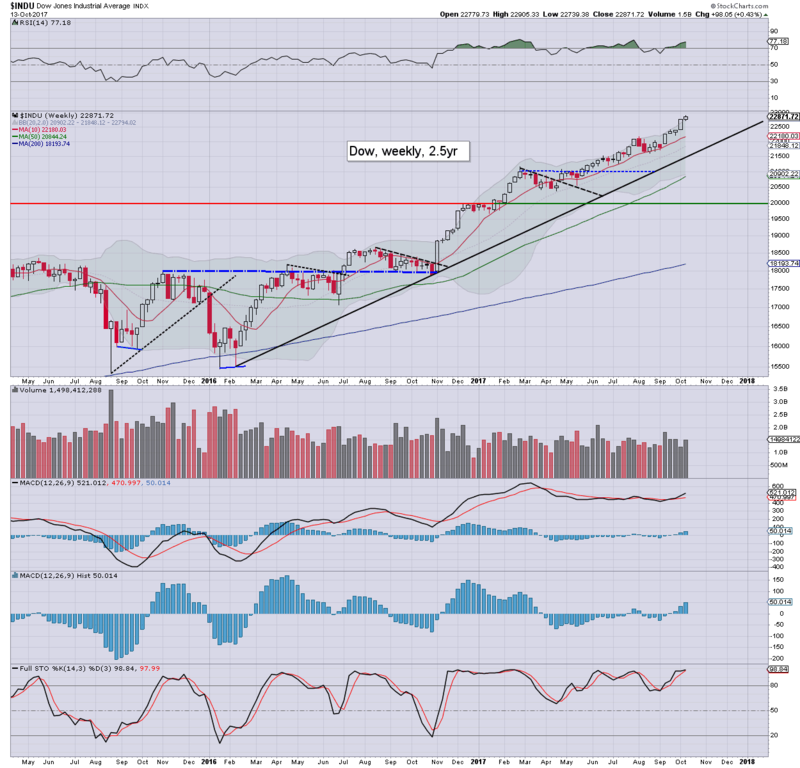 The mighty Dow saw a fifth consecutive net weekly gain, +0.4% at 22871, with a notable new historic high of 22905. Underlying MACD cycle is on the high side, and there will be threat of cooling to the 22200/000 zone, before the next big push upward. Things would only turn bearish with a break of rising trend, which will be in the 21500s next week. Keep in mind the monthly 10MA is currently at 21375. The master index climbed for a fifth week, settling +0.3% at 12352, with a notable new historic high of 12377. Cooling of around 3% to the 12k threshold would be very natural, and would do no damage to the mid term trend, which was recently adjusted, due to a new historic high. 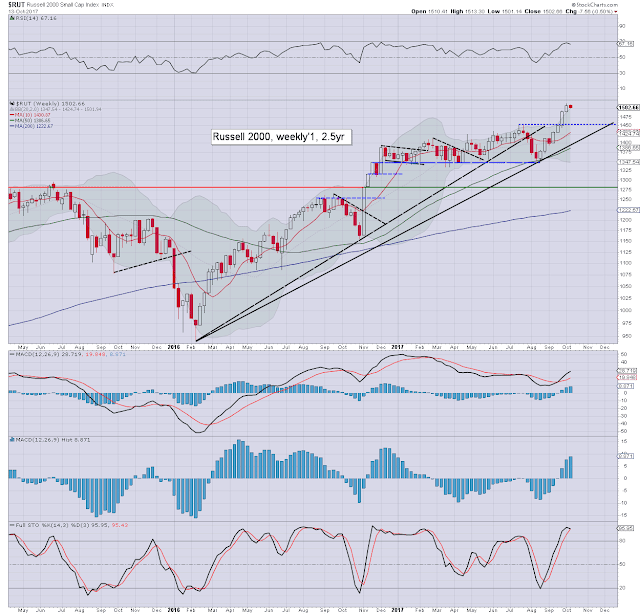 The R2K was the laggard this week, unable to break a new historic high, and settling net lower by -0.5% to 1502. Short term bearish to 1450. 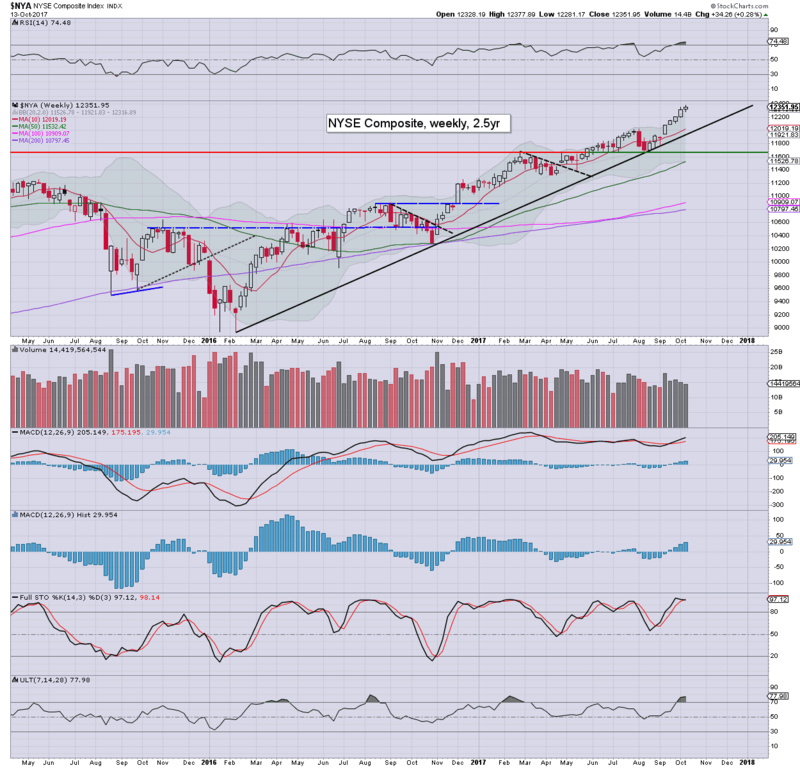 By late Oct', core rising trend will offer support in the 1420s. Unless that is broken, a year end close in the 1600s will remain a valid target. The grander issue is that 'R2K @ 2K' is on the menu in 2018. The 'old leader' - Transports, saw a net weekly gain of 0.5%, and that was despite a Friday decline of -1.0%. The weekly candle was rather spiky, having cooled from a new historic high of 10080. 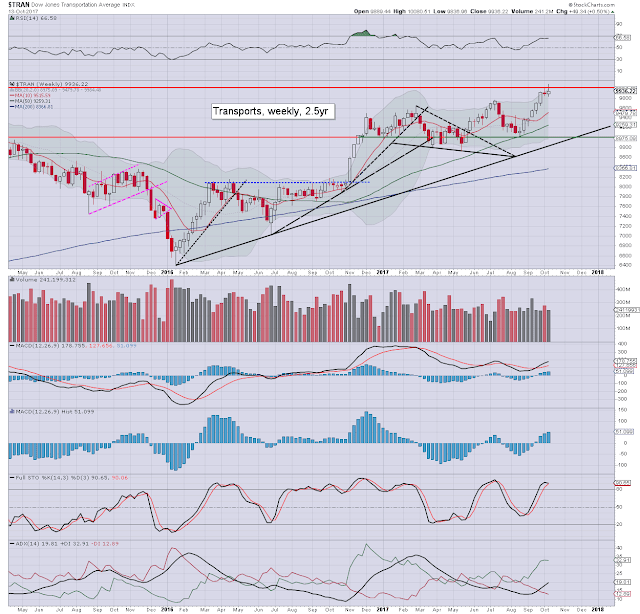 Near term outlook is bearish, with the 9600/500s well within range. No price action under the 9k threshold can be expected before year end. 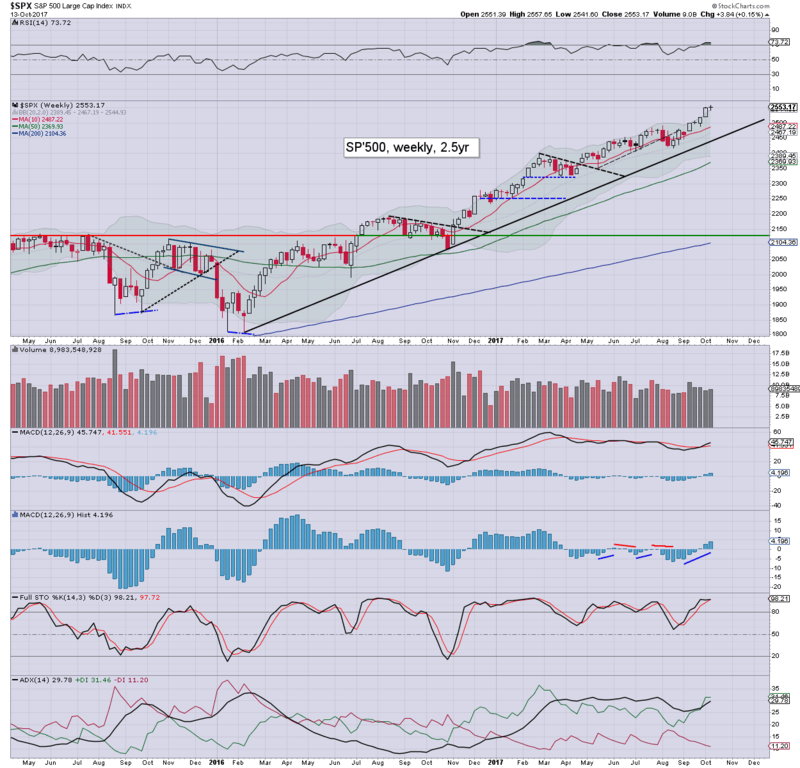 The US equity market remains broadly super strong, with 5 of 6 indexes breaking new historic highs this week. 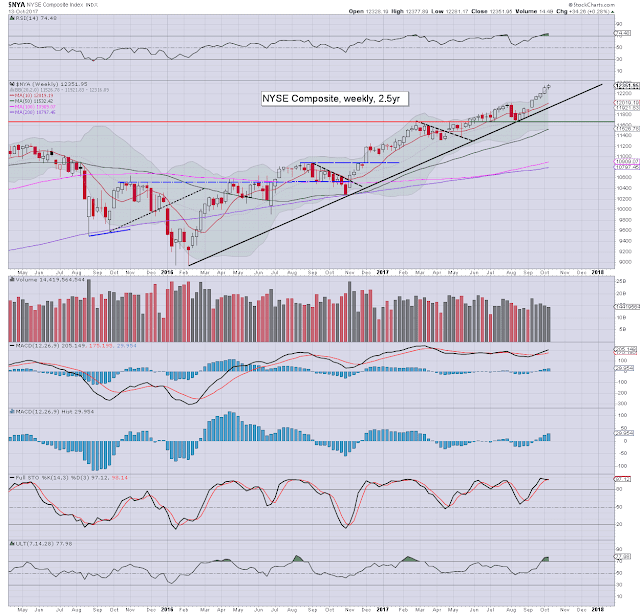 All US indexes are holding their mid term bullish trends from early 2016. All US indexes have at least 3-4% of downside buffer before the m/t trends are challenged. *There are a few fed officials scheduled, most notable is Yellen (Friday lunchtime), and I believe it will garner live coverage on CNBC.